When you have a message to tell the world, you need the media. But your agenda might not match the reporter’s agenda. At RHL, we will show you how to transform a newsroom’s request into an opportunity to convey your message with persuasion and force. And you will learn how to present yourself as an active participant and not a hapless victim. Our goal is to give you the confidence and tools to control this experience and not fall for the tricks of the trade. RHL offers group sessions or ‘1-2-1’ workshops depending on your requirements. All are led by professional journalists and cameramen steeped in experience. We come to your place of work complete with technical equipment or we use tv studios close to your business. And our guarantee is to put you in front of the camera and microphone as often as time allows. RHL uses participatory training, professional camerawork and instant playback to analyse progress. And you receive a full recording of your day’s work and a follow up email to highlight your strengths and weaknesses. 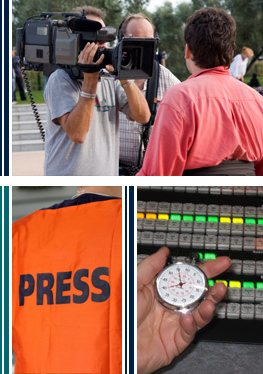 RHL seminars in Accessing the Media take the mystique out of dealing with a newsroom. • How to handle a crisis to convey vital messages. RHL uses tailor made scenarios to assure that you learn how to access the correct people and produce perfect copy. With these skills, comes confidence. And with confidence, comes results.